Deemed one of the oldest and most important 19th century mansions in the Crown Heights North Historic District, the Dean Sage Mansion, along with the convent for the St. Gregory the Great R.C. Church and the garden at 839 St. Marks Avenue (Block 1222-Lot 1), has served Brooklyn as supportive housing for mentally ill people since 2005. So why has the NYC Landmarks Preservation Commission (LPC) approved demolishing the convent and tearing up the garden to surround the mansion on two sides with an apartment building about two stories taller and of starkly different architecture? Why has LPC approved the construction of 48 units of affordable housing on this lot when the owner, ICL Real Property Holdings (ICL), has a contract with the NYS Department of Mental Health and Hygiene (OMH) to provide housing for mentally ill people there for 25 years? The deed specifies the lot will be used for this purpose for 25 years commencing October 27, 2005. On March 1, 2016 Crown Heights North Association’s President Deborah Young sent a letter to the Institute for Community Living (ICL) objecting to “attaching a architecturally inconsistent building to the Dean Sage Mansion”. This was followed by the online petition—Petition to Stop Irresponsible Development at one of Brooklyn’s last Historic Landmarks—going live in the same month. The petition’s authors are Robin Burland, member of the St. Marks Independent Block Association (SMIBA), and SMIBA President Shirley Mondesir. SMIBA and the Crown Heights North Association (CHNA) are joined by Brooklyn Community Board No. 8 (Brooklyn CB8), Crown Heights North Historic District (CHNHD) and Friends of SMIBA in the effort to maintain the current configuration and use of Block 1222-Lot 1. “839 St. Marks Avenue is not only supportive housing for the mentally ill but provides other services to the community. It has been a place for block association meetings for the past 15 years and the mansion’s garden is used to display artwork during the annual block fair,” explained Shirley Mondesir. Mondesir wants to bring attention to LPC’s decision so that the public is aware of the situation. She said that she wants “to fight to the end with the satisfaction of having made the effort rather than just acquiesce to the decision”. Mondesir believes the average New Yorker has the power to positively affect his community. Why does LPC forego the area’s historic landmark district designation and the existence of a historic and architecturally distinct building such as the Dean Sage Mansion and the convent? Perhaps, it is the sign of the times. One executive committee member of Brooklyn Community Board No. 8 sees the new LPC Chairwoman Meenakshi Srinivasan “to be unsympathetic to historic landmark districts…Srinivasan stated previously her desire to dump all backlogged historic landmark districts’ applications and have them reapply”. The fact is 95 properties that were placed on LPC’s calendar before 2010 are part of a fast-track initiative wherein review, comments and disposition will occur between July 2015 and December 2016. Seven of the 95 properties are located in Brooklyn. Signs of the times include Crown Heights and the rest of Central Brooklyn that has become sought-after residential addresses. Adjacent 4-story brownstone town houses are knocked down to make way for 10-story and taller residential elevator buildings where rent for studio apartments start at $2,000. On March 22, 2016 Derrick Hilbertz and Shirley Mondesir speak before LPC to oppose the construction of 48 units of affordable housing. Other defenders of the current usage and lot configuration in attendance were Robin Berlind, CHNA’s Ethel Tyus, Brooklyn CB8 Chairwoman Nizjoni Granville, Neville Bryan, Dr. Kinshasha Shabaka and Dr. Rosemarie Phillip. Contrastingly, Flatbush resident Diana Foster spoke in favor of the addition. LPC Chairwoman Srinivasan was in favor of ICL’s proposed changes and requested that the architects return to LPC with modifications of the drawings. June 23, 2016: Shirley Mondesir, Robin Berlind, Nizjoni Granville, Ethel Tyus and Dr. Shabaka met with City Council member Robert Cornegy and his Chief of Staff Stefani Zinerman to present the case to keep 839 St. Marks Avenue as is and requested a letter of support from CM Cornegy which he agreed to give. However, the support letter was not provided that month. August 21, 2016: CM Cornegy attended the memorial program for the Crown Heights Riots at Brower Park. Shirley Mondesir talked to Cornegy about the missing support letter. CM Cornegy directed Mondesir to call his office the next day to obtain the letter. August 22, 2016: Mondesir called CM Cornegy’s district office to be informed that he is out of the office. The staff member who took the call referred Mondesir to a City Council committee; however, Mondesir was not dissuaded from requesting the support letter from her CM. August 24, 2016: Mondesir called CM Cornegy’s district office again but is able only to leave a message. ICL Real Property Holdings has over a dozen land parcels in Brooklyn. 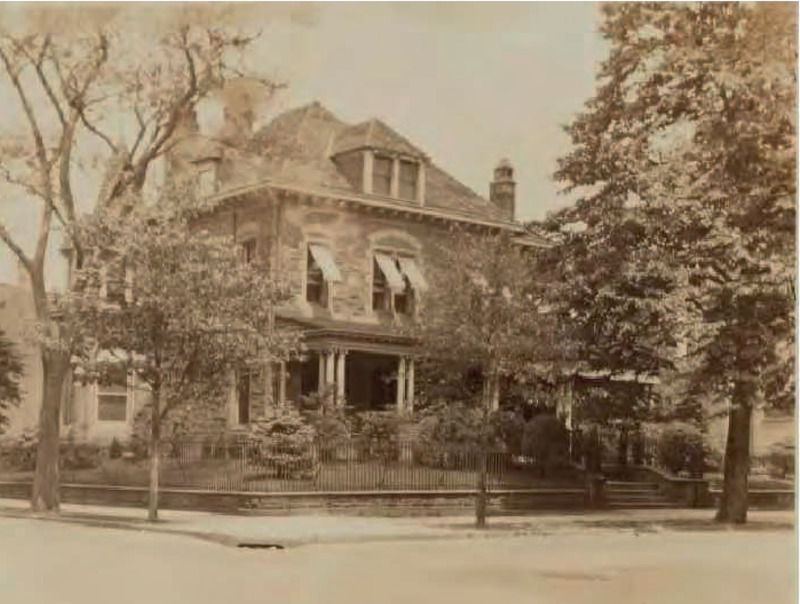 What factors led to selecting 839 St. Marks Avenue for construction of 48 units of affordable housing, given the Dean Sage Mansion at 839 St. Marks Avenue is a historic and architecturally significant building, and located within the Crown Heights North Historic District? ICL evaluated each of its buildings in Brooklyn and other locations to determine whether there were potential development opportunities for supportive and affordable housing. 839 St. Marks Avenue has approximately 31,650 square feet of available development rights, which is what made this site attractive for our project that aimed to include mixed-use housing. We knew going in that any changes needed LPC approval. We have identified other properties that can be leveraged for additional, much-needed supportive and affordable housing and are pursuing those opportunities as well. For the most part, ICL’s properties are fully built out and cannot be expanded. ICL has worked with a team of talented architects – Dattner Architects and Easton Architects – for upwards of a year to come up with a plan that was sensitive to the context. ICL fully recognizes that this is a very special building and block and is restoring the mansion well beyond what would be required by the LPC (e.g., restoring the interior, returning the front porch, replacing the roofing with slate-like material). We also worked closely with the LPC’s staff to arrive at the plan that the LPC ultimately approved as appropriate to their standards. Is it true that ICL/ICL Real Property Holdings has a contract with the NYS Office of Mental Health and Hygiene (OMH) to provide [supportive] housing for persons with mental illness at this block/lot for 25 years which expires on or about October 26, 2030? If yes, when did OMH give written consent to the affordable housing construction project? ICL currently operates 839 St. Marks Avenue as a Community Residence, which is supported by an OMH operating and services contract. The project is also supported by a DASNY bond, which expires in June 2026. ICL has been working with OMH on the planned redevelopment of 839 St. Marks Avenue for over a year. The contract would be reprogrammed and the bond would be paid off upon the new use as permanent supportive housing. The planned financing for the redevelopment has a regulatory agreement that restricts the use to supportive and affordable housing for at least 60 years. The renovated permanent supportive housing will sustain ICL’s mission while offering dignified independent living opportunities for adults with mental illness as well as low-income adults and families. The new public financing will enable ICL to modernize and expand this important housing resource and operate it as supportive and affordable housing for decades to come. Is it true that the construction project involves demolishing the convent which is used for housing for the mentally ill? If yes, is OMH in written agreement to the demolition? The LPC-approved plans call for the demolition of the 1930’s extension and that is ICL’s intention. OMH does not separately approve the demolition as this is an LPC matter. 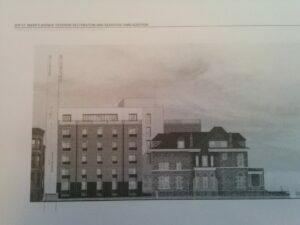 The drawings of the proposed completed project appear to surround the mansion on two sides by a brick rectangular building that is 2 stories taller than the mansion. Will you please explain the decision for choosing the material and building style? Some critics say it is architecturally discordant. After extensive discussions with LPC’s design staff and two meetings with the Landmarks Preservation Commission, the current plan was approved. The planned new construction is a single building that is fully integrated with the mansion, and it does not wrap around the mansion. Instead, it touches the mansion at one corner and exposes more of the mansion than has been on view since the 1930s. In the new design the mansion will be able to be viewed “in the round”. This site plan shows this skylight glass connection. Determined to stop the project, Derrick Hilbertz retained an attorney to challenge the LPC decision by submitting an Article 78 against it. An Article 78 is a legal challenge to a ruling from a New York City agency. This document was filed before August 12, 2016 in City Hall: LPC vs. Derrick Hilbertz. It is being amended to add the St. Marks Independent Block Association and Bergen-Kingston Block Association, which are opposed to LPC’s ruling on 839 St. Marks Avenue.